Twenty wild boar have been killed by residents of a village in Zanjan, Iran. The Zanjan Department of the Environment reports that the boar had gathered at a water hole to drink in the farming region of Ijrood when the residents attacked them with hunting weapons, clubs, stone and iron bars. In recent years, several farmers have complained about the boar destroying their crops. Sporadically, local officials have issued licences to hunt wild boar. 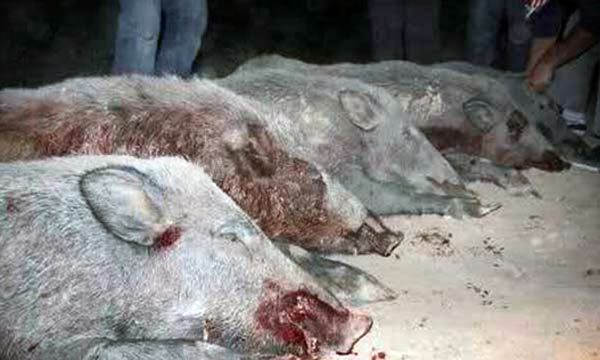 The Zanjan Department of the Environment has announced that 15 people were involved in killing the 20 boar. The report adds that rangers have managed to arrest three of them so far and continue in their efforts to identify and arrest the others. The accused will have to pay eight million rials in damages for each dead wild boar. They could also face fines and prison terms. The Department of the Environment says the public is not allowed to attack the boar without a permit, and offences in this regard will be subject to prosecution.